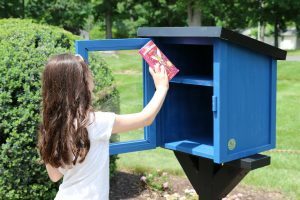 A nine-year-old book-lover and Vint Hill resident’s desire to share her love of reading with her community has led to the first library box in the Vint Hill area. The Little Free Library Box was installed at Cannon Park, located across the street from the Piedmont Dogs park, earlier this month. The idea and its execution came from 9-year-old Molly Baker, a local resident who frequents Vint hill’s parks often. The box operates as a book exchange; with its initial collection of books, one may simply donate a book to the box and in turn take a book. By this design, new books will continue to circulate through the collection. Inspired by a television program that featured the free “library box” concept, Molly and her parents researched and found the non-profit organization called “Little Free Library,” whose mission is to provide access to books through community connections. The family settled on a blue, two-shelf model designed to withstand weather. The library box is registered in Molly’s name and included in the Little Free Library database, which allows people to easily search and find the library online. The box will hold both kid- and adult-friendly literature. The Baker family was set on bringing the library box to Vint Hill as a complement to the park that they already enjoy and to add a reading component to the area. After meeting with Vint Hill Village, LLC president Ed Moore to present the donation, they jointly settled on Cannon Park, Vint Hill’s first pocket park, established in 2015, as the box’s location. The box is the second Little Free Library location in the greater Vint Hill area, joining one on Starcrest Drive in the nearby Grapewood neighborhood. While the books are free for readers, the box was not. Molly used her personal savings, including allowance money and birthday funds, to purchase the box. She also donated a number of books to begin the Vint Hill library collection. In addition to her love of reading, driven by an early fascination of books, Molly participates in the National American Miss Pageant. 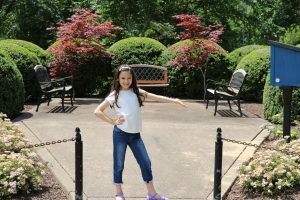 In 2014, she won Little Miss Fauquier and, in 2016, East Coast USA Little Miss Virginia. While her pageantry involvement has taught and encouraged Molly to focus on community service at such a young age, her parents say she’s always had a spirit for charity and giving. Three years ago, Molly responded to a donation request from her vacation bible school by emptying her piggy bank and bringing the money to school. Molly’s vision to enrich her community through reading doesn’t end with the first library box installation. She has created a Go Fund Me account to raise $1,000 for two more boxes that will grow the community-centric cause. Her goal is to inspire her neighbors and community to embrace the same love of reading that she has. Little Free Library is a 501(c)(3) nonprofit organization that inspires a love of reading, builds community, and sparks creativity by fostering neighborhood book exchanges around the world. Most Little Free Libraries are placed in front yards, parks, gardens and easily accessible locations. The Libraries are built to withstand weather of all kinds and hold 20-100 books. To be officially called a Little Free Library, a free book exchange must be registered with an official charter sign and charter number. There are over 50,000 registered Little Free Libraries in all 50 states and 70 countries. To learn more about the Little Free Library cause, visit: https://littlefreelibrary.org/. To contribute to Molly’s cause, visit: https://www.gofundme.com/mollys-little-free-library-fund.